Every year, the maintenance of the golf course lawn uses large amount of pesticide, which shall diffuse into the air, flow into the rivers, lakes and other water area nearby with the rain or sprinkling water. The pesticide may also leach into the groundwater or be absorbed by the crops and target organisms, which will pose great threat to the biological environment. In order to alleviate the pesticide pollution and protect the environment, the study and development of the organic pesticide and fertilizer for the golf course has been a hotspot recently. Since the organic pesticide and fertilizer is featured by low residual toxicity, strong efficiency,good anti-insects and pest control effect and sound fertilizer efficiency.It not only can regulate the soil, protect the microorganism in the soil, promote the soil water retainer and enhance the fertility of the soil. Therefore, it has significant meaning in maintaining the soil ecosystem and protecting the environment by promoting and applying the organic pesticide and fertilizer. Tea seed meal, also known as tea seed cake, is a kind of puce granule and produce by the residue of camellia seed after oil extraction. Tea seed meal contains 12% to 18% saponin which is a kind of hemolytic toxin and can melt the red blood cell of the fish. As a result, tea seed meal is widely used to clean the fish pond and kill the insect in the paddy field. It also has a sound effect on preventing and controlling the pests like earthworms, cutworms, nematodes, leeches, etc. while applied to the upscale lawn, without polluting the soil. Tea seed meal is also a kind of high effective organic fertilizer due to its high content of protein, which is widely used in the plating of crops and fruit trees with sound efficiency. When compounding tea seed meal with other pesticide and use it to the golf course lawn, the effect on anti-disease and controlling pests is even better. Feed grinder, granulating disc, air-flowing oven, and nylon sieve. Boluo Tangquan Golf Course: test area No.1 is set at the green where exist many earthworms and ants; test area No.2 is set at the lane with many cutworms and locusts. The control group CK1 is set at the green and CK2 at the lane. Dry the tea seed meal under the temperature of 60 degree and grind it further until it can pass the 0.83mm sieve. Add the kieselguhr and 20ml polyethylene glycol and other agentia with certain proportion, and then use the granulating disc to make the granule. Add the original pyriproxyfen or mildothane powder according to different formula and the requirements of preventing and controlling the disease and pests and develop the tea seed meal organic fertilizer pesticide with different ingredients. The test sets 3 treatments, 3 repetitions and Randomized block arrangement. Each treatment area is 10mx10m and there is a 2m long isolation strip between two treatment areas. Broadcasting shall be adopted and the dosage shall be the preparation dosage. Do not spray water after using the fertilizer pesticide, without forming surface runoff. Take the samples at 5 am at the same community, and the sampling frame is 0.5mx0.5m. The time of checking the earthworm includes before spraying the pesticide, 1d, 3d, 7d, 10d after spraying the pesticide. Collect respectively all the earthworms and snails in the area 15cm high above the surface of the sampling ground, and count the total number of the earthworms and snails. The checking time of preventing efficiency for cauline leaf pests includes before spraying the pesticide, 1d, 3d, 7d, 10d after spraying the pesticide. Collect respectively the number of cutworms at each treatment point. The examination for the cauline leaf pests shall be analyzed by percentage that the coverage of the infected grass accounting for the total sampling area. Observe and record the growing height of the tested lawn (check 10 grasses at each area for 3 times, and take the average) and the biomass (the quality of the fresh grass per unit area for 3 times and take the average). Assess the efficiency of the tea seed meal fertilizer pesticide by comparing with the control group. According to the requirements of preventing and controlling diseases and pests, we developed 2 kinds of tea seed meal organic fertilizer pesticide and the proportion of the ingredients is listed in table 2. Formula 1 is the tea seed meal organic fertilizer pesticide; formula 2 is the tea seed meal · pyriproxyfen fertilizer pesticide which is developed for preventing and controlling Solenopsis invicta, cutworms, earthworms, mematode and other pests. The control effect of the tea seed meal fertilizer pesticide on the earthworms and snails in the golf court lawn is presented in table 3. 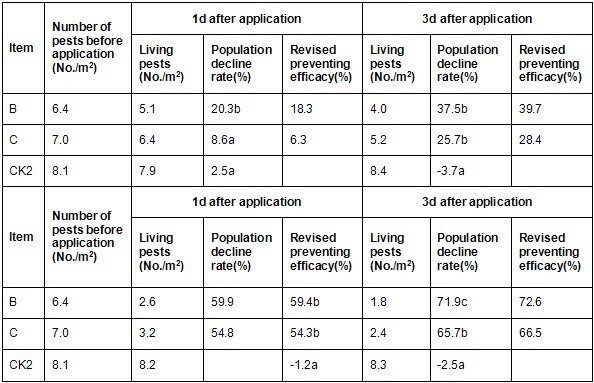 It shows that the number of the living pests is decreasing in the treatment area gradually, and the number in the control group area in increasing gradually. The revised effective rate of preventing pests reaches 48.7% 7d after spraying the pesticide and the revised effective rate preventing pests reaches 77.5% 10d after spraying the pesticide, which demonstrate a relative better preventing and controlling efficacy. It is analyzed that the tea seed meal not only has the function of killing the earthworms and snails by contacting and stomach poisoning, but also has repellent effect which can increase the population decline rate of the pests. Table 3 The preventing efficacy of the tea seed meal on the earthworms and snails in the golf court lawn. According to the study, tea saponin can not only kill the pests and control earthworm by itself, but also can enhance the efficiency of some other pesticides. Researchers like Dong Daoqing have tested the enhancing efficiency of tea saponin on Tripterygium wilfordii emulsifiable concentrate while killing the Ectropis oblique larvae. They discoved that adding 2000mg/l saponin to the Tripterygium wilfordii emulsifiable concentrate with various concentrations has significant enhancing effect on killing larvae at the instar of 2. To achieve the same efficiency, tea saponin can reduce 85% dosage of the Tripterygium wilfordii. He Xiaoling adopted leaf residual film method to test the efficacy of the tea saponin on the plutella xylostella’s anti-feeding behavior and toxicity effect, which prove that the main effect of tea saponin is plutella xylostella’s anti-feeding behavior. Wang Xiaoyi tested the effect of tea saponin on pieris rapae’s anti-feeding behavior, which shows that in the event that the concentration of tea saponin is higher than 800mg/l, it has strong anti-feeding activity on the pieris rapae larvae at the instar of 3, 4, 5; The concentrations of AFC50 for anti-feeding within 24hours are respectively 130.36, 172.97, 220.86mg/L. The result of the field plot experiment shows that 4000mg/L saponin liquid and 2000mg/L saponin liquid have great effect on protecting the leaves and controlling the pieris rapae. Tea seed meal · pyriproxyfen fertilizer pesticide not only can prevent and control earthworm, cutworms, noctuid and planthopper, but also has the function of enhancing the fertilizer efficiency and regulating the soil. The growth dynamic change trend of the grass in different lawn areas treated by different fertilizer pesticides is shown in Fig.1. From the change condition of the grass growth height in different treatment areas in Fig.1, it is found that the height of the grass in the Green Treatment A is higher than the control group (CK1) at any time, which indicates the good efficacy of tea seed meal fertilizer pesticide on enhancing fertilizer. The height of the grass in the Lane Treatment B and Treatment C is much higher than the control group (CK2), which indicate better fertilizer efficacy. Therefore, tea seed meal has great fertilizer efficacy. Some studies have proved that tea seed meal contains many organic matter and nutrient elements like N, P, K, Ca, etc, which can promote the growth of the grass. The change trend of the biomass in different lawn areas treatment is shown in Fig.2. Fig.2 shows when comparing fertilizer pesticide treatment area with non-fertilizing area, the ground biomass difference is rather remarkable, especially 25d after fertilizing treatment. While comparing Treatment A and Treatment B with the control group, the difference is rather remarkable (P<0.01). Treatment C is similar to the control group CK2. The above results show that the growth condition of the grass on the lawn has remarkable change due to the application of tea seed meal which shows a great fertilizer efficacy. In the daily management on the golf court lawn, while keeping the excellent application properties of the lawn, it’s significant to reduce the management expenses (including the cutting frequency, irrigation amount, etc.). Therefore, using the sustained-release organic fertilizer can delay the growth speed of the lawn, decrease the ground biomass and then relatively decline the lawn cutting frequency, which shows the special efficacy of the organic fertilizer compared with the inorganic chemical fertilizer. Tea seed meal organic fertilizer pesticide contains all kinds of organic matter with proper proportion of N, P and K, which has sustained-release property and benefit the coordination and growth of the ground biomass. Plant-base fertilizer pesticide uses insecticidal plants’ tissue which contains active ingredients as raw material. At the same time selectively adding moderate chemical pesticide to the plant-based fertilizer, it shall have the properties of fast-acting and long-lasting with certain fertilizer efficacy. This granular plant-based fertilizer pesticide can be spread uniformly by using the mechanical operation just like other fertilizers when applied to the golf course. Its using amount is easy to control; effective component is not easy to loss; and it would not pollute the atmosphere due to volatilizing easily or contaminate the surface water around caused by running off with the rain overland flow. The study of the tea seed meal and compound fertilizer pesticide shows that the insecticidal effect can be highly improved by mixing the tea seed meal with chemical pesticides. The tea seed meal fertilizer pesticide is very effective in expelling earthworms and killing snails, etc. wherein saponin has played a significant role in improving the efficacy. However, while preventing and killing cutworms and meadow moth, it would be more effective mixing tea seed meal with other chemical fertilizer pesticide. The experiment made by Wang Xiaoyi shows that saponin can enhance dimethoate efficiency on preventing and killing Rhopalosiphum maidis; the result of the test by Hu Shaohai shows that saponin can increase the efficiency of methomyl, cyhalothrin, pyridaben and other pesticide while mixed with them. What’s more, it can lower the using amount of the effective component of the original chemical pesticide, reduce the pollution and protect the environment. Tea seed meal contains large amount of organic matters and plant nutrient elements like N, P and K, which can not only increase the content of organic matter in the soil and provide abundant nutrient for the lawn, but also prevent the lawn from over growth, regulate the Ph value of the soil without soil hardening and have significant efficiency on increasing fertilizer and regulating soil. In addition, the secondary metabolites of tea seed meal like tea polyphenols, tea pigment and tea saponin are antioxidants which can acavenge free radicals, chelate with metal ions, regulate plants growth and significantly increase the bioavailability of the tea seed meal. Botanical compound fertilizer pesticide contains chemical synthetic insecticidal ingredients and botanical insecticidal active ingredients. Chemical synthetic insecticidal ingredients have fast-acting property and botanical insecticidal active ingredients have the properties of sustainable release and persistence. The botanical compound fertilizer pesticide has multiple mechanisms like killing the insects and pests by contacting, stomach poisoning, anti-feeding, repelling and ovicidal action and it is not easy for them to become resistant to the pesticide. Botanical pesticide has low toxic substance and residue. It is environmental friendly which has the protective function on the beneficial insects like bees, spiders and butterflies. It is beneficial for the ecological balance.